AJD 959 is a Morris Commercial CV11/40 new in 1945. 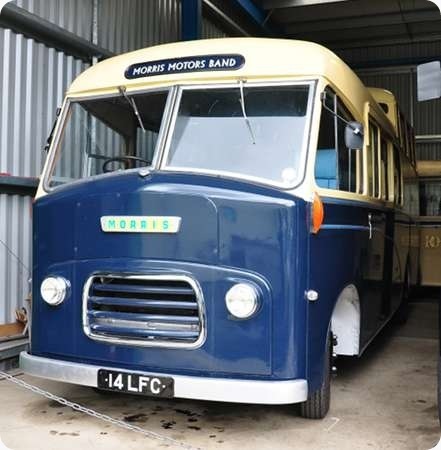 She started life with a van body, which was replaced by Mr Harry Stocker in 1959. The capacity is given as C16F, but should it be FC16F? 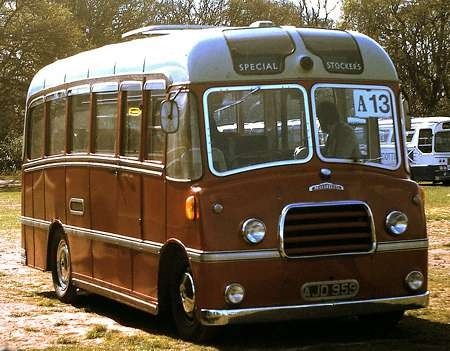 She’s on Southampton Common, arriving to take part in the Southampton City Transport Centenary Rally on 7 May 1979. This is an interesting vehicle, not the only conversion done by this operator who was also a coal merchant. One other similar vehicle also survives, if memory serves. It was quite a challenge for him to build the coach body, I’d hazard, but the result is quite attractive, with, as ever, rear wheel spats improving the look immensely. The lower body front bears some resemblance to some Provincial bus/coach bodies built by Reading & Co. I view the narrow width of the front axle with some trepidation, recalling the rare times I had to drive one of BT’s Commer/Dodge PB Spacewagons, which dug into the road at every conceivable opportunity, when deviating from the straight and narrow! 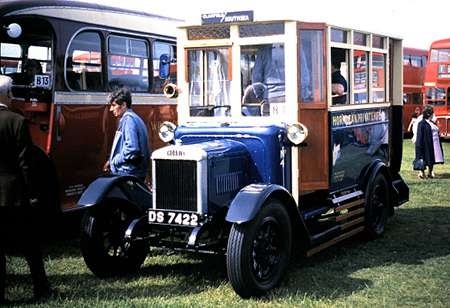 Dreadful, underpowered vans, which had to be driven, foot to the floor, to even reach 50…… eventually! Driving a desk was more fun! The F for full front is only used for chassis which were usually bodied as halfcabs. Those which were always full-fronted. e.g. 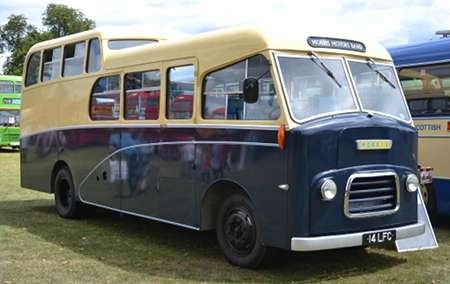 Bedford SB, Albion Victor, are simply C.
A handsome vehicle, in sharp contrast to some of the dreadful van-derived minibuses. It seems very long for the seating capacity, was it 2+1 seating? Thank you, Chris and Peter, for your thoughts. 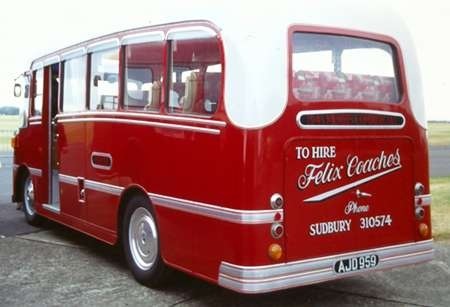 I have found a shot of AJD 959 in later life she’s seen at Duxford for Showbus in the markings of Felix, Long Melford. The date is 28 September 2003. I can’t answer your question, David. The figure is as given in the PSVC listing for 2012. There could be a typing error in there (26?) because the back row looks to have 5 seats. I am a bit puzzled by the chassis designation of this vehicle. The CV11/40 was a goods model generally of normal control layout, though a similar design, classified CVF, had semi forward control. 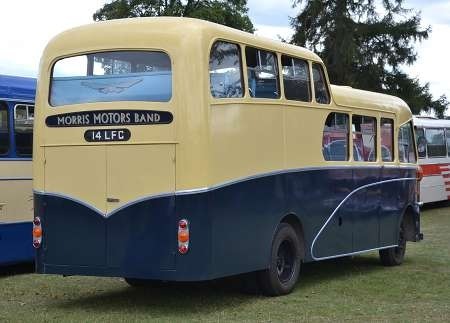 A few CV11/40 chassis were bodied as small buses/coaches like the example seen in this link:- www.sct61.org.uk/zzlyh285 Was AJD 959 rebuilt to forward control? The normal control machine shown in the SCT link had a 17 seater body, so 26 seats in the Stocker coach would seem to be unlikely. This lovely little vehicle visited the Manchester MoT at Boyle St last year (and was at St Helens before that) so I had a chance to inspect its interior. It definitely has 16 seats – I counted them! Does anybody know its current whereabouts? Given its bijoux dimensions it could well be kept at its new owner’s home. Zooming in on http://tinyurl.com/pfknpa8 reveals that there are just four headrests showing at the rear, but they are so wide that it must be 2+1 seating. So I suggest (2+1)x4 + 4 = 16.